Sophie Thompson played both the roles of Celia and Rosalind, in succession with different companies. 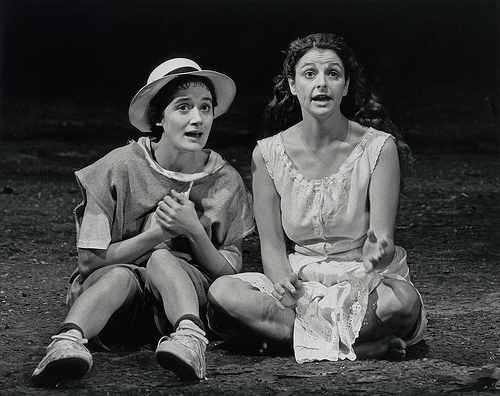 According to her essay, Rosalind (and Celia) in As You Like It, having played Celia before taking on the role of Rosalind informed how she embodied Rosalind. As the characters are so intertwined throughout the play this is hardly surprising. But did the playing of Celia impact how Thompson played Rosalind in a beneficial way? Thompson certainly values her experiences of playing Celia, for how they informed her decisions about how to best play Rosalind. However Rosalind is already a character that is chiefly defined by her relationship to Celia, at least in the beginning of the play. Thompson may have over relied on her intensive background in the motivations of Celia rather than examining the inner workings of Rosalind, as her own woman. Celia, frequently redirects conversations and sympathies towards herself when she engages with Rosalind (1.2. 1-13 & 1.3 88-102), and Thompson exhibits some of the same unfortunate tendencies in her portrayal of Rosalind. The most obvious instance of this is when Thompson is discussing the exile of Rosalind. In that she surprises even herself with her boldness in addressing Duke Frederick. Furthermore after the verbal sparring with the Duke, Rosalind needs the comfort of Celia and dressing up as a man to make herself feel better. While I agree that this scene marks a turning point in Rosalind, I think these lines serve as the beginning of her empowerment. Which she takes one step further by throwing off the societal conventions of womanhood and assuming the identity of a man. Thompson derives her interpretation of this scene from how she interprets Celia’s role in this scene. In Thompson’s role as Rosalind, she plays the scene such that Rosalind is broken down by her conversation with the Duke, while Celia has taken courage from her cousins words and is now ready to console her. However though Celia does insert herself into the conversation on her cousin’s behalf, her actions following the Duke’s exit can hardly be considered consolatory. Though Rosalind is the one who has been banished, Celia insists that she is the more aggrieved of the two. If the scene is read with less concern for the motivations of Celia and more interest in conveying the mindset of Rosalind herself, than it can be seen as her first steps toward liberation. Rosalind not only accepts her banishment, but excels in it later in the play, directing her own fate and those of others. Celia does prompt Rosalind towards dressing as a man and going to Arden, but to not recognize Rosalind’s own agency in this scene would be a disservice to the character. While Thompson characterizes this “dual perspective” on the play as constructive, it biased her portrayal of Rosalind by overemphasizing the importance of Celia is many of Rosalind’s actions. Thompson may have been playing Rosalind in her second performance of As You Like It, but given her self-described thought process in depicting Rosalind, a more apt name for her essay would have been Celia (and Rosalind). This entry was posted in Performance and tagged As You Like It, Celia, Rosalind, Rosalind and Celia, Thompson on July 28, 2015 by .